The lady and I are taking a trip to Virginia in April to visit her family. 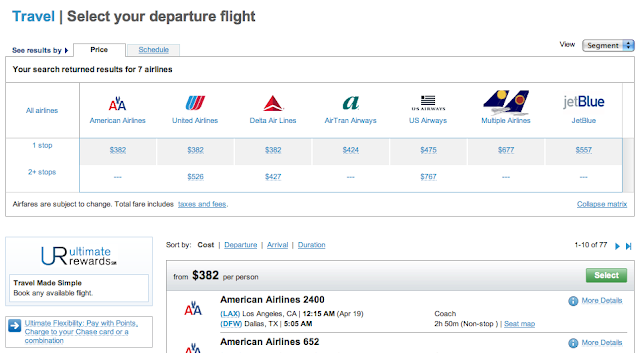 Before booking our tickets, I knew that I had to look around to find the best deal on plane tickets. The first place I went was Kayak.com. Kayak is a great site because it searches hundreds of travel sites at once for the best price on flights, hotels, car rentals, cruises, and other vacation deals. 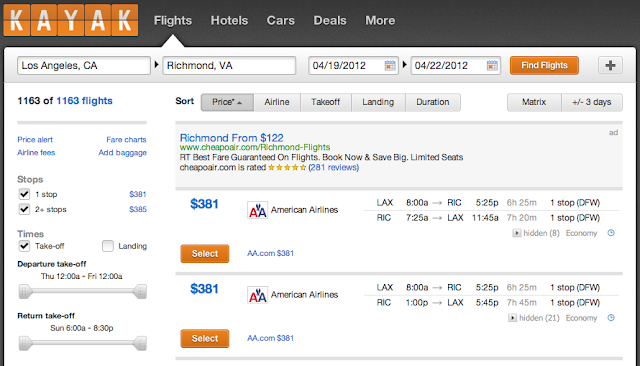 Sites that Kayak searches through include: Priceline, Expedia, Travelocity, Hotwire, and Orbitz. This site will save you the trouble of individually going to other travel websites to find the best deal. Fun fact: the cofounders of Expedia, Travelocity and Orbitz formed Kayak together in 2004. Through searching on Kayak, the cheapest flight I found was through American Airlines for $381 each way x 2 = $762 for the both of us. The next thing I did was go to ultimaterewards.com to see what Chase Ultimate Rewards point system had to offer. Chase Ultimate Rewards points are transferrable between different credit cards. That’s why the Chase Freedom and the Chase Sapphire Preferred cards are an unbeatable combination. I can earn 5% on rotating categories on the Freedom card, and then transfer those points to my Sapphire Preferred card, which earns 2% on travel and dining. Within the Chase Ultimate Rewards Travel program, I was able to find the exact same flights for the same price as elsewhere online. Book using some of my Chase Ultimate Reward points, which gives me a 20% discount on the flight. In this case, my 36,865 points could be converted into $460.81 travel credit. Obviously I converted the points to flight credit, because you get much more cash back than 1 point = 1 cent. In my instance, 1 point = 1.25 cents. If I converted the 36,865 points into direct cash into my account, it would only be $368.65. Using it on the Chase ultimate rewards site gives me $460.81. The original flight cost for the both of us would have been $762, but now with the use of my Chase credit card and travel site, the cost was only $301.59. Don’t forget, the remaining charge I put on my card will earn 301.59 x 2 = 603 points (2x points on travel purchases). 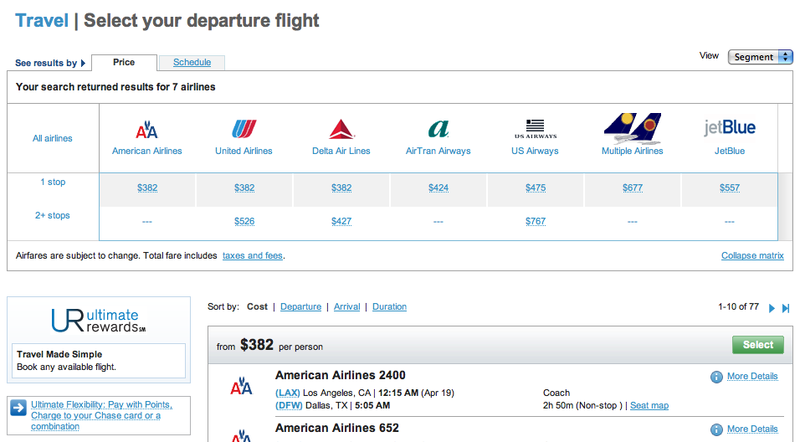 Before purchasing this ticket to fly on American Airlines, I made sure I went to AA.com to sign up for their frequent flyer program, AAdvantage. You can join the program here. Lastly, I connected another one of my Chase Sapphire cards (yes I have 2: one regular and one preferred) to the AAdvantage dining program. This is similar to the Southwest Dining program I previous wrote about. You can sign up for the AAdvantage dining program here. 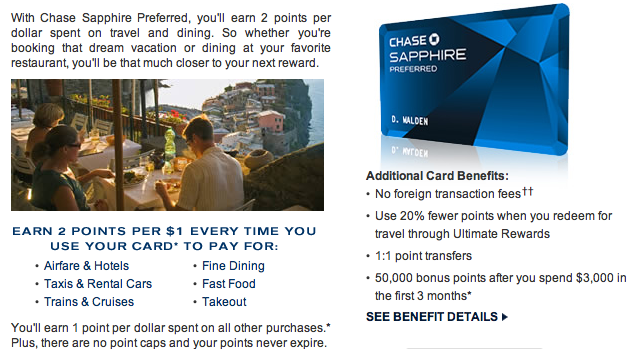 Just like with the Southwest Dining program, when you eat out at a restaurant or bar affiliated with the program, you earn frequent flyer miles as you dine, and this is on top of the 2x points (2% cashback) earned when paying for your restaurant bill with your Chase Sapphire card. Yes all of this sounds like a lot of work, but as you’ve just read, it’s really not that difficult to score the best price on a flight, and it is even easier earning points on everyday purchases and miles eating out as you normally would. Remember, paying less for the same flight doesn’t cheapen the experience. Use that money on things that really make you happy.